IdSurvey allows you to generate and manage your mail campaign for CAWI surveys directly within the software. 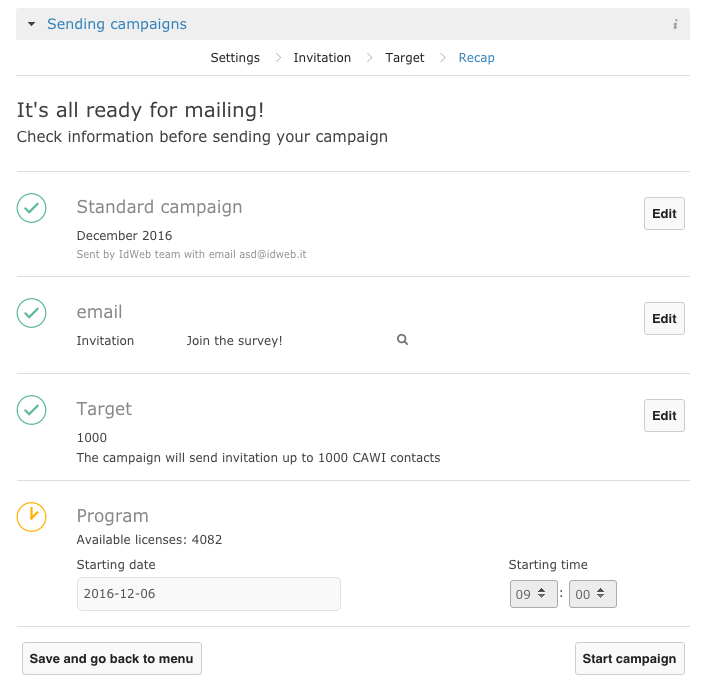 In section “Sending Campaign” of CAWI tab in survey Settings you can create a CAWI Smart email campaign or a Standard email campaign. 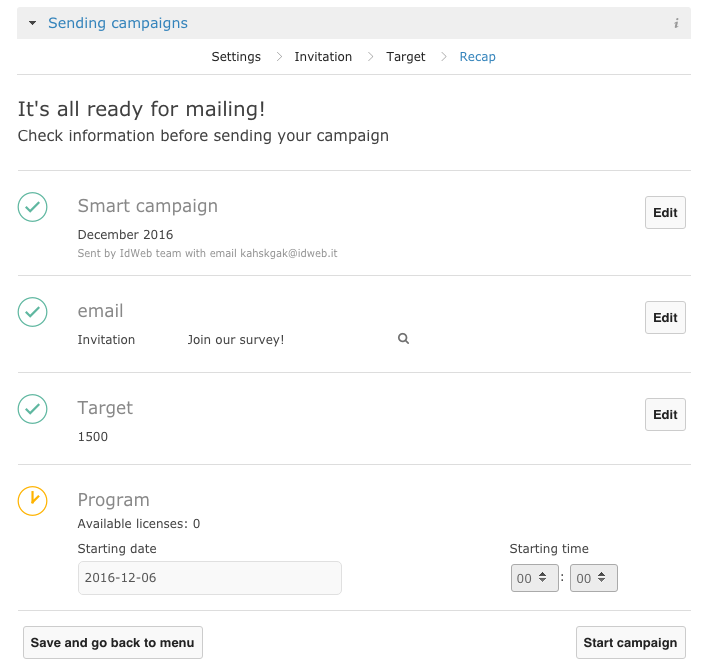 Both email campaigns are used to send invitations to join your survey to respondents, but there are some slight difference in scheduling the delivery. You can decide number of emails to send. All emails will be sent at the date and time you scheduled. You can decide number of interviews to complete. When you create a CAWI Smart email campaign, though, the email sender will automatically manage emails according to quotas, interviews completed and email licenses used. Smart campaign runs a control every 24 hours on statistics of previous dispatch and invites new respondents until the number of completed interviews set is reached. Respondents who match the quotas set have the priority. The number of emails sent every day is calculated according to completion rate of previous despatch. The first step is to choose the type of the campaign between Standard and Smart. In this article we’ll show you how to set a Standard Campaign so we have to select first option clicking on “Select” on the right. Name your campaign: insert the name of the mail campaign (for example: “December 2016”). 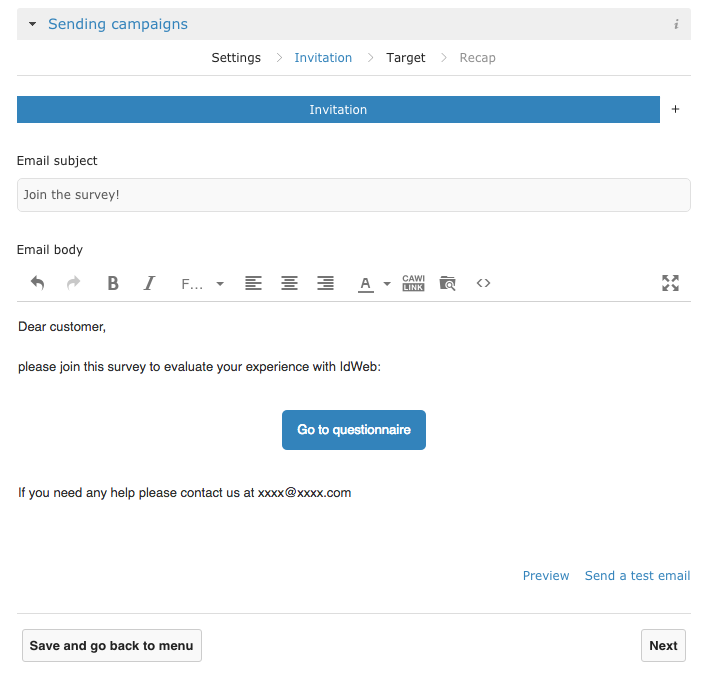 In every survey you can create multiple email campaigns. To go to following section click on “Next”. In following section “Invitation” you have to set the email to send to your respondents. Email body: the text of the email to send to respondents. Within this text you can insert contacts database information writing the field you want to display within curly brackets. To insert the link to the interview in the email body just click on “CAWI LINK” button you find in the editor. The link inserted will be a customized link for each respondent. If you click on “Preview” on bottom right you will display a preview of the email or clicking on “Send a test email” you can send a test to one or more email addresses. Clicking on “+” button near the Invitation bar on top right you can add one or more reminder emails. In this case you will have to set the subject, the email and also “Send after” where to specify after how many days from the invitation you will send first reminder to those who didn’t complete the interview. Clicking on “+” button another time you can also send a second reminder specifying after how many days from first reminder IdSurvey will have to send the second one. To guarantee data integrity, the link button in test email cannot be clicked! 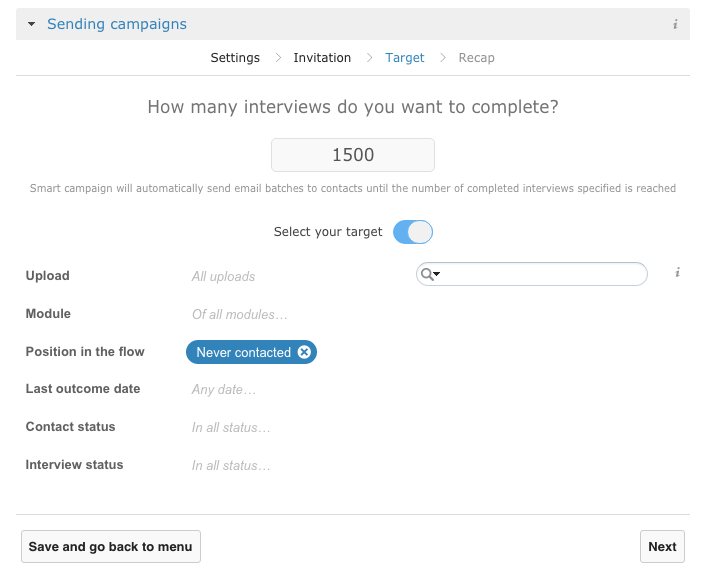 In Target section you can set the number of interviews you want to conclude for this campaign. The number insert has to be less or equal to number of contacts inserted in Contacts Management. When you use this number when you create a CAWI Smart email campaign, IdSurvey will autonomously send invitations until the number of interviews specified is reached. If quotas are set, the software will send invitations to contacts that matches the quotas first and then – if needed – to all other contacts. Other than total number of emails, you can also specify a target for your campaign. The target can be specified filtering the contacts in Contacts Management and selecting a specific part of the list. You have several options to compose the filter. You can use them all or just ones needed. Interviews Status: you can choose contacts with “Interview not started” or “Partial interview”. If contacts that match the target are less than contacts to invite specified above, you will display a red alert on the bottom of the page. If you don’t specify the target, IdSurvey will send number of emails specified in the box to generic contacts. Alternatively, you can click on “Save and back to menu” to save what you set and go back to campaigns menu. The email sender will always send the invitation only to useful contacts ignoring those with a completed interview, out of target or marked with other definitive outcomes. Contacts invited to the campaign cannot be used for other campaigns in the same survey. Once you completed the 3 steps, you will find yourself in the Recap page where you can see (and eventually edit) what you set before. If the recap is correct, click on “Program” button on bottom right to set time and date of the first email. To save and activate the campaign click on “Start campaign”. In the “Sending Campaign” box you will display all campaign created in your survey. Campaign not confirmed yet will have a grey icon and clicking on the gearwheel button on the right you can enter the actions Edit, Duplicate or Delete campaign. Confirmed and programmed campaigns will have a yellow icon and clicking on the gearwheel button on the right you can enter the actions Pause or Duplicate. Once the campaign is sent, clicking on the gearwheel you will also be able to check “Statistics” to consult information on emails sent. To delete a programmed campaign select Pause first then click on the gearwheel again and select Delete.